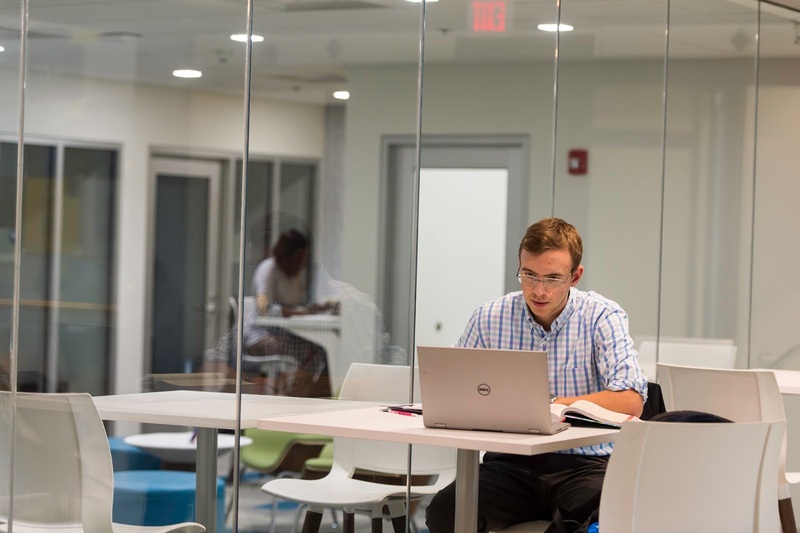 Open work spaces and a more modern look are transforming the Simon experience and helping prepare students for success in today’s collaborative work environments. This past May, Simon Business School embarked on several important upgrades that are designed to enhance the student experience, create more space for collaborative learning, and reflect a modern business environment. The first to be updated in the summer of 2016 was the technology and audio/visual equipment in Gleason Hall, Rooms 118/119. 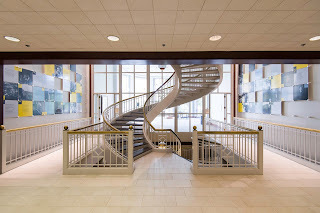 This summer, the Eisenberg Rotunda and the newly formed Office of Student Engagement (OSE) have seen some of the most significant upgrades the School has made in decades. But it is where students gather to meet and interact outside of class that has seen some of the most dramatic improvements. “One of the greatest opportunities for the School is improving the quality of the Simon experience,” says Bruinooge. “That’s why we wanted to create a space for the OSE that will be the center of student interaction. Having it across from the spiral staircase and the Rotunda seems sort of natural. It all helps create a bright, inviting space that we think will really energize the environment.” Bruinooge notes that the Rotunda’s facelift included fresh paint, new window treatments, and movable furniture so students can modify the space to fit their needs. Simon’s director of operations, AJ Warner, has been directly involved with transforming the student spaces. She explains how the new OSE space has invigorated Schlegel Hall. “Room 215 used to be a classroom and was eventually turned into a storage room,” she says. “They tore down the walls between that room and Schlegel 201 to double the space of what used to be the Student Services office. The new space has a bright, collaborative meeting area in the center with glass walls that bring in all the light from the Rotunda. It’s a lot more open and modern.” Warner notes that the Rotunda will have automatic blinds that rise and lower to replace the old drapes and curtains.